Themos Mexis was born in Rhodes, Greece, in 1947, and migrated to Australia with his family in 1953. He began to show his love and skill in music from a very young age, teaching himself instruments such as harmonicas, small accordions, drums and guitars. Following high school, during which he undertook preliminary studies at the New South Wales Conservatorium of Music, Mexis left for Europe in 1967 to further his musical studies. 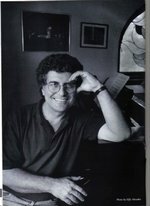 He studied first at the Conservatorium of Santa Cecilia in Rome and, in 1970, was granted a scholarship to complete his studies at the Hellenic Conservatorium in Athens, graduating in 1972 and gaining honours in piano, composition and teaching. Returning to Australia in 1974, Mexis received a Composer's Award to study electronic music at the NSW Conservatorium. In 1976 he conducted the first of seven major concerts featuring music composed and arranged by him. These concerts were presented to audience in Sydney, Adelaide and Melbourne. Mexis's music ranges from symphonic works through to simple popular songs. His output includes music for film and television, and numerous works have been funded through grants from the Australia Council. He has been guest conductor of the Kuring-gai Philharmonic, Melbourne Philharmonic, and Australian Pops Orchestra. He has also held the position of President of the Music Arrangers' Guild of Australia (MAGA). As a teacher, Mexis has been invited to lecture on aspects of Greek music and of his own style at the Universities of NSW and Sydney, and at various high schools. He continues to teach piano and theoretical studies to select students. Melody in D : for guitar and symphony orchestra (1978) Commissioned in 1978 for “So What!” a short film produced and directed by Art Mayer for Qantas airlines.